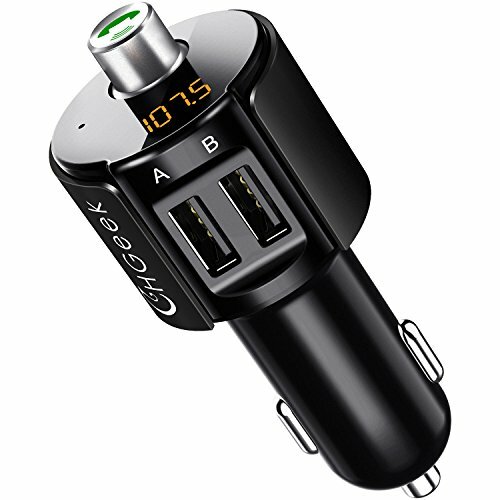 ThisCHGeek CH05 Bluetooth FM Transmitter is multifunctional which can make your driving more interesting. 2.Search a BLANK band in your area by Google, long press the button of this kit until the Channel keep flashing, then match this kit and your radio to the same blank Channel. 3.Activate your phone's Bluetooth, when the phone detects a unit named "BT_C27A", pls press it to connect. 4.After connection, the music from your iPhone X 8 plus 7 plus 7 6S/Samsung Galaxy S7 S6 edge/iPod/MP3 player will be streamed out. EASY OPERATION & BROAD COMPATIBILITY: Easy one button operation for pausing, skipping song and adjusting volume. Available for iPhone X 8 plus 7 plus 7 6S 6 Plus iPad iPod, Android Samsung Galaxy S7, S6 edge, Blackberry, Sony, Nexus 5X 6P, Moto, MP3 MP4 Player etc. Wireless stream music to your car FM stereo system. Tips: the sound would be better if you tune the channel to 106.0~108.